Kenai Riverfront Resort is located on the Lower Kenai River in the heart of the best King, Red & Silver Salmon fishing, and between the towns of Soldotna and Kenai. With more than 200 feet of river frontage and two acres of beautiful grounds, our location is a great choice for your summer getaway or fishing adventure. A rocky shore, with great bank fishing access, a private boat launch, and a beautiful view of a wilderness island, you'll soon forget how close you are to the modern conveniences of our small towns of Kenai and Soldotna. The map below shows our location and also points out many of the most productive King Salmon fishing holes in the Lower Kenai (Sunken Island, Big Eddy, Honeymoon Cove...), all within a short boat ride of Kenai Riverfront Resort! Driving Directions: Take the Seward Hwy from Anchorage, past Girdwood & Portage, through Summit Lake Area, and watch for the Sterling Highway (Highway #1) as you near Cooper Landing and turn right onto the Sterling Highway (in the direction with signs leading to Kenai/Soldotna/Homer). Follow the Sterling Hwy through Cooper Landing toward Soldotna. As you enter Soldotna, turn right on Kenai Spur Highway (2nd traffic light just past Fred Meyer store), drive 1.8 miles on Kenai Spur Highway to Big Eddy Road, turn Left on Big Eddy and drive .9 miles to Douglas Drive (across from big ship), turn Left on Douglas and follow Douglas to the left past our Kenai Riverfront Resort sign, turn right in first driveway. Beige ranch style house with green roof right on the Kenai River. So kommen Sie zu uns: Sterling Highway von Anchorage bis Soldotna. In Soldotna an der zweiten Ampel nach dem „Fred Meyer“ Geschäft rechts abbiegen auf den Kenai Spur Highway, ca. 1,8 Meilen (2,89 km) fahren bis zur Big Eddy Road (die Strassenschild kommt schnell), dort links abbiegen und ca. 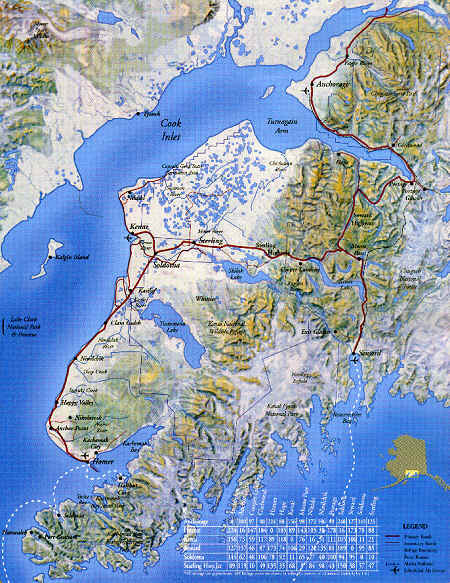 0,9 Meilen (1,45 km) fahren bis zum Douglas Drive (gegen dem grossem Boot), dort links und Ausschau halten nach dem Kenai Riverfront Resort-Schild. Das erste Lodge rechts ist Kenai Riverfront Resort. Fahrtzeit von Anchorage ca. 2,5 Stunden. Use this Link to download a PDF copy of our driving directions and Google Map, or use the interactive Google Map shown below. Just a short 20 minute flight from Anchorage, or a 2 1/2 hour scenic drive through the Kenai Mountains, will bring you to Kenai Riverfront Resort. If you are driving, print out our SCENIC DRIVE GUIDE for information on the points of interest along the way. If you are flying, we can help you arrange local transportation, with airport pickup in Kenai or book a car with one of several major rental car companies at the Kenai Municipal Airport. Below is a general map showing the Kenai Peninsula and road system to Soldotna and the Kenai River, roughly 140 miles south of Anchorage.